It's Earth Month, and, more specifically, it's Earth Day. What better way to observe Earth Day than with an environmentally-conscious, beer-related story? 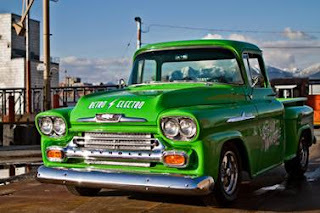 The good folks at Toronto's Steam Whistle, who have a pretty nifty fleet of unique delivery / serving vehicles (check out The Steam Machine), have added a 1958 Chevy Apache to their fleet. Saved from the scrap heap, Retro Electro was fixed up and modified to use an AC electric motor. Keeping it green (above and beyond the colour), the energy used to power the truck is BC wind energy from Bullfrog power. Not just for show and casual cruising, the truck is capable of generating 465 foot-pounds of torque, and will actually sometimes serve as a delivery vehicle. After browsing around their site at some of Steam Whistle's other information, I was surprised at just how green the company is in several ways, and what they have done with the environment in mind. It's pretty commendable.